Be it books, newspapers, or movies, thieves are one of the most captivating personalities of all time. They are known for living a dangerous yet exhilarating lifestyle filled with risks and uncertainties. You must be familiar of the leading and popular robbers of the present time, but do you know that this is an old profession and was equally famous during the historic era. So here is the list of most famous thieves of history who were known not just to live an adventurous and thrilling lifestyle, but also to result in the most famous robberies of the history. Butch Cassidy was the leader of one of the famous robbery gangs, Wild Butch Gang. Along with his partner Sundance Kid, the couple was famous for famous historic robberies. The pair and their group were famous for carrying thefts from trains and banks. The group soon became the hot target of the Pinkerton Detective Agency, and they then flew to the United States. It is believed that the duo died in Argentina during a shootout. With her full name as Arizona Donnie Barker, Ma Barker was a famous personality known as Kate Barker. Despite being a lady she was the leading personality of the famous Barker Gang. She was also presented in historic films, songs, and literature. According to the historic president, J. Edgar Hoover, she was one of the most clever robbers who actually did not conducted any robbery on her own, but was the planning authority behind her team. He was considered a notorious gangster of America who robbed around 24 banks and 4 police stations with his team of gangsters. In the situation of great depression, he stood top among numerous famous burglars, like Clyde, Baby Face Nelson, and Bonnie. He was a famous bank and train robber and among the famous robbers of the Wild West. There are even pictures directed on the big screen on this thief starring Brad Pitt and Casey Affleck. There was even a younger brother of the robber named Frank James, who used to support him in carrying various robberies. James was killed by one of his gang members. His killer Robert Ford wanted all the fame of Jesse James, and hence, he killed the famous thief. Like other famous and notorious thieves, even Clyde Barrow and Bonnie Elizabeth were a couple that were known to perform havoc across the United States. They were famous historic robbers of that era. Besides conducting robberies with their gang members, the duo conducted numerous robberies in rural gas stations, small stores, and banks. There was a famous Jay – Z and Beyonce song planned referencing the duo. While most of the famous robbers of history carried robberies in banks, Harris-Moore was famous for robbing hundreds of private residencies, boats, small aircrafts, and cars. He created a terror among the residents and therefore was also popularly known as the Barefoot Bandit as most of his robberies were committed while he was barefoot. In 2012, he was sentenced for his crimes and is famous as one of the biggest robbers for carrying robberies in residents. The original name of this gangster is Lester Joseph Gills, who was a renowned robber and got his nick name of Baby Face Nelson because of his highly youthful experience. It is known that the thief once helped John Dillinger to escape from the prison. She is a famous thief that was known across the region. During her career of five years, Payne targeted numerous high-end boutiques and stores. She made a lot of money by acting as a wealthy customer looking for her engagement ring and then resulting in a big robbery. Despite being carrying such robberies for years, she was imprisoned for two years at the age of 83. With a net worth of $2 million stolen money and goods, he is a famous historic thief. With numerous cars stolen in a series, this thief stepped forward into a high-profile robbing project that targets banks and other top financial institutions. He used to carry robberies only on Friday, and hence, was popularly known as the Robber of Friday Night. During the robberies, he used to cover his face with a mask to hide his actual identity. He was once arrested during a robbery, but when he was free, he again engaged into such activities. The famous picture Catch Me if You Can has been pictured on the lifestyle and work of the famous thief, Albert Spaggiari. His biggest robbery was the one done in Societe Generale where he and his team entered through an 8 meter tunnel dig closed to the sewer. But the robber and his group were arrested and imprisoned. A famous criminal of the American Civil War, he had his unique ways for every robbery. He resulted in numerous high-end robberies in train and bank during the 19th century. He was a premium robber. But was cheated by one of his team member. His team member had troubles with his way of carrying the robbery and hence he killed him during a group robbery. Bill Mason is one of the most successful thieves in the history that have gain recognition for numerous successful robberies. His most popular robbery was the stealing of gold medal of the famous athlete Johny Weissmuller. It is believed that later on the medal was returned by the thief to the winner through post. Veerappan, one of the most popular and dreading thief from the Western India. He was not just popular and successful, but also the most wanted robber in Indian history who lived within the southern forests of India for almost 20 years. Veerappan carried numerous sorts of wild games, smuggling thousands tonnes of sandalwood and ivory and even killed the strongest forest officer. Eventually, he was killed in an encounter, but his terror is still aloud among the village residents. While you would always appreciate and cherish the timeless painting of Mona Lisa by Leonardo Da Vinci, this painting was once stolen by the famous robber Viceno Peruggia. Formerly, he worked in a gallery and stole painting during the daytime, hiding its identity and adorning the uniform of a senior officer. He even smuggled successfully the painting to Italy. The painting remained there for couple of years. But ultimately, the thief and painting were caught and he was imprisoned. He is may be the only thief who has had success equal to what he scored during the robbery run. He is one of the cleverest thieves of the history and with his cunningness he resulted in numerous scams of millions of dollars from financial institutions. He was famous for carrying cheque frauds across 26 countries in just five years. He started his criminal career at the age of 16 years. He gave rise to one of the biggest robberies and when he was caught by the FBI, he then switched to an honest profession of operating a financial consulting business. He was a famous robber of the 15th century. He spent his childhood as an orphan, but later he was adopted by a rich clerk. He was an intelligent student but he turned to crime and joined a gang of robbers, known as Gang Des Coquillards. He robbed numerous public offices and churches and was arrested in 1462 and was released after few years of imprisonment. He was also a famous French poet and his poems are still a hit among the French people. Alan Golder begin his criminal life at just 6 years of age and by 21 he was an expert in stealing jewels. He used to sell the stolen jewels to the NYC black market. He used to work for the popular Genovese crime group, the robber used to carry thefts into homes of notable personalities, like Johny Carson. He was famous for carrying thefts during dinner parties. With excellent gymnast skills and flexible body, Charles Peace was famous for his short height of 5’4” and big robberies in stores and homes of London’s riches. He was eventually caught and hanged till death in 1879. He carried numerous robberies for almost 30 years and he died when he was at an age of 70 years. He was a popular bank robber who was named as the Interstate Bank Mart Bandit by the police professionals. He was famous for robbing the banks that were located even inside the supermarkets. It is believed that he got into the robbing business in order to meet his family needs. During his career, Brankle robbed 43 banks and was sentenced to 21 years of imprisonment for carrying all such nasty thefts. This thief was also a famous English highwayman who is famous to ride from London to New York on his horse in less than 24 hours. Besides his thefts, this is another reason to why Turpin has managed to make a reputed name in the history. It is noted that Turpin began his career as butcher and soon he started stealing sheep, cattle, and lamb for his butcher shop. Once he was caught red-handed and he then fled away and joined the famous Gregory Gang, also famous as the Essex Gang. This gang used to steal money from the riches of the London. Turpin then joined the gang of highwaymen, but there was a huge sum announced on his capture, and so he flew to Yorkshire where he changed his name to John Palmer, but continues to carry robberies as a highwayman. He was ultimately caught and was soon sentenced to imprisonment. He was one of the richest thieves of the history who was bibliomania and was arrested in 1990, for stealing costly books from museums and universities. He became popular as the Book Bandit and is considered as one of the most efficient thieves in the history. He did not sell the stolen books, but kept them with himself. He was once caught red handed and was imprisoned for 4 and half years. He continued to practise this business after being released from the prison. It is not a single individual but a group of individuals who became popular as the Fat Cat Burglars. This was a gang who operated well and became popular in 1960s and 1970s. The gang was headed by two brothers-in-law, Dominick Latella and Peter Salerno. They were famous for stealing the rich Americans during dinner parties. While one of them kept the guests busy in fine dining and completing the dinner. The other used to break into the house and steal jewels and money. If anything was supposed to go wrong, then the one having dinner used to transfer the signal with a whistle or unique sound. Also known as the Forty Elephant Gangs, this was a gang of 40 female thieves. They were in operating since 1870s to the 1950s. According to the police records, the gang is in operation since 1700s. The gang members used to adorn in specially tailored clothes and were known for stealing goods of thousands. These women were also popular to search for employment in the rich houses and then rob the entire house. It happened that only few members of the gangs were arrested while others were still in operation. Robbery is a dynamic profession, which is followed by large numbers of people not just today but even in the past. 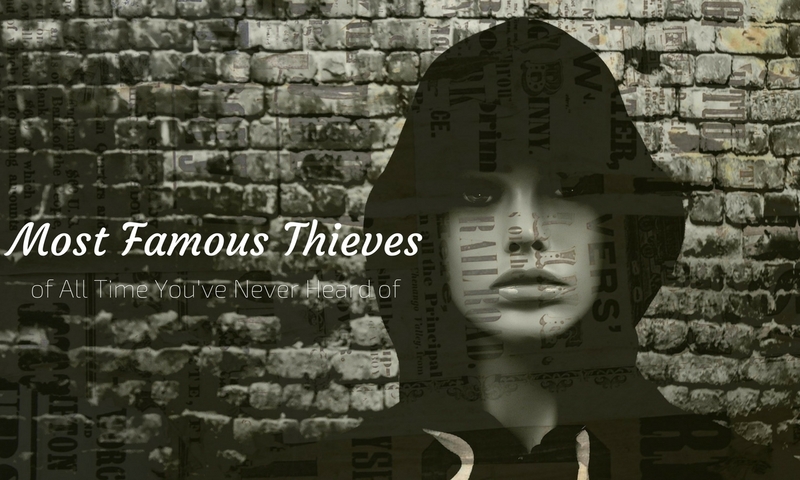 These are the top thieves of the history and if you are fascinated by their ideologies and lifestyle, then you can always grab more details about them online.